Artists Answer Questions: How Has a Sustainable Outlook Changed Your Art Practice? This month's artist's question is unintentionally very fitting - right on time for the Plastic Free July challenge. The question of sustainability in art making has been on my mind a lot this year. Over the past few years, I've made it a priority to eliminate as much waste as possible from my household and live a lifestyle that is in line with my values. Now that I've taken care of the waste in my home, I've turned my attention towards my art practice. The way sustainability is apparent in my art practice is through re-use; I'm always painting over old canvases, saving studies to use in collages, and all the fabrics I use are thrifted or donated. As I delve into experimenting with more ways that I can create work that doesn't harm our planet, I wanted to reach out to a few other artists with a focus on sustainability in their practice to learn about their process. 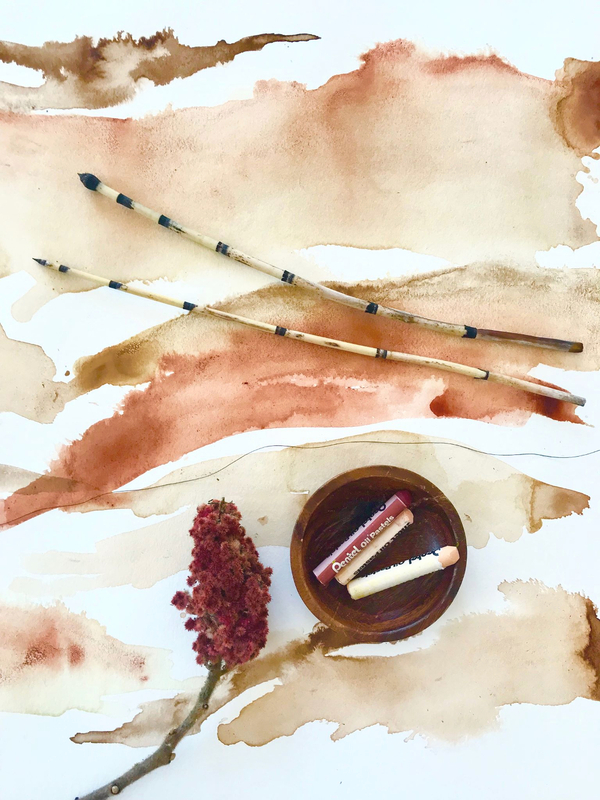 Inspired by her natural surroundings, Melissa Mary Jenkins’ paintings reflect the fluidity of the seasons and the movement of her soul in nature. Melissa lives in a lovely rural setting in an old stone farm house surrounded by vibrant landscapes. Her studio is framed by windows looking out onto dazzling golden fields, towering pine trees, a flourishing apple orchard and a natural pond. Melissa’s abstract landscapes reflect the colours of the seasons, the lines of the hills surrounding her studio and the trees dotting the horizon. "I have developed a cyclical pattern that involves cleaning and organizing my studio, loving the minimal aesthetic and then allowing it to become chaotic and then cleaning and organizing again. On my most recent clean up, I was collecting all the paper towels, baby wipes and paper plates that had accumulated and something inside me had just had enough. Not only was I disgusted with the state of my studio, but I was overwhelmed with the amount of waste that I had generated. So, I removed the tempting paper towels and baby wipes and swapped in rags from old clothing and towels. But I made sure to only use rags that appealed to me visually or tie into the colors in my paintings. This may sound ridiculous, but I am on a bit of a campaign to incorporate beauty into all aspects of my life and using a rag that inspires me helps me elevate the mundane. This focus on reducing paper towel waste led to my daughters and I sewing hand towels and cloth napkins and taking the paper towel roll out of our kitchen and bathrooms. We wipe our hands and mouths on our cloth napkin and then hang it on the back of our chairs for the next meal (we learned this concept from our very eco conscious family members living in Western Canada). We also keep a basket on our kitchen table full of rags and cloth napkins so we have easy access. Around this time, I was also introduced to the beauty of natural inks. I have begun to paint with ink that I created from avocado stones, dandelion petals, purple onion, walnuts and purple cabbage. It feels so wholesome and earthy to not only create my own supplies, but also be able to create with them. I have also delved into experimenting with dying fabric from avocado dye and I am in love with my creations. We have dyed cloth napkins, clothing, towels and plant holder bags. Another element that I have introduced at the suggestion of my fellow artists, is to use an old piece of glass from a picture frame to mix acrylic paint on instead of paper plates. I have so many old frames lying around, that I thought this idea was brilliant. I think the most important element of changing my studio habits is the awareness that reaching for the easiest or convenient item doesn’t necessarily foster a creative environment. I feel as though my world has been opened up into new creative endeavors simply because I wanted to make a change. I also need to acknowledge that dedicating yourself to change is so much easier when you have children who see the world as so simple. They have learned through their amazing schooling that harming the environment is “bad” so we need to change. And while I have so many more elements to change to become more sustainable, our girls certainly keep me accountable." Mariah Reading is an eco-artist and strong advocate for the existence, preservation, and accessibility of the National Parks. She was born and raised in Bangor, Maine where the surrounding landscape gave her a deep appreciation of nature’s beauty that was reinforced by her degree in Visual Arts at Bowdoin College. The 2016 National Park Centennial propelled her “Recycled Landscapes” project designed to bring attention to the need of preserving and protecting the environment. Having already visited 19 National Parks, she plans to continue her project in all 59 US National Parks. Mariah has dedicated herself to the field of eco-art through a recent AiR at Denali National Park, working as an Arts In the Parks Volunteer at the Guadalupe Mountains National Park, assisting in Yosemite Facelift efforts, developing a K-12 STREAM curriculum with University of California Santa Barbara Oceanography students, and creating conservation workshops with the Channel Islands National Park. She has exhibited work in San Antonio, TX and Brunswick, ME and has another AiR at Zion National Park in September. "I started my Recycled Landscapes series during the spring of 2016. I was finishing up college and was taken aback at the amount of waste created within the arts. I have always been drawn to the natural world and began to draw a parallel between feeding landfills and painting landscapes. That year happened to be the National Park Centennial and I planned a cross-country road trip from Maine to California in order to move out for a teaching job. I became invested in the parks and started collecting trash found in each location in order to turn it into a canvas. This practice eventually led me to finding single objects in National Parks that spoke to the specific location of the park- hubcaps in highly trafficked areas, buoys in coastal areas, and water bottles everywhere. Currently, I am taking strides towards mitigating my own footprint in and out of the studio. I am committed to finding ways to have a zero-waste art practice. To do so, I use recycled water to paint with and have eliminated paper towels by only using cloth rags. The surfaces I paint on are either trash objects found on trails, or remnants of my own waste. I have been saving my crusty paint brushes and empty paint tubes and will eventually form these items into a canvas themselves to keep them out of a landfill. I recently was the Artist in Residence at Denali National Park. The big draw to this park was its connection to the Zero Landfill Initiative. Before heading out to my backcountry cabin, I spoke with the rangers in charge of the recycling and waste management center of the park and got to go dumpster diving for objects to paint on. One of the comments that stuck with me the most was Ranger Bill describing the process of emptying trash bins in the Denali Visitor Center day after day, full of disposable coffee mugs. The process of keeping a park clean is ongoing and never ends. It took me a while to recognize the connection of this action to my artistic process in Denali. It is only a 10 day residency, so I had this frantic energy about me, attempting to make use of my every waking moment and paint as much as I could. What I’m realizing now is this energy and constant churning out of art was a way for me to grasp the ever-persistent waste management cycle. During my stay in Denali, I only found ONE piece of trash. Most visitors only witness the pristine park and do not understand the MONUMENTAL amount of time, energy, and money it takes to keep Denali clean behind the scenes. I hope my work can shed light on these efforts and present lenses for viewers to take opportunities to be thoughtful about their own waste in order to leave landscapes more beautiful than they found them!" Britni Mara is a Chicago based visual artist with a Bachelor of Fine Arts Degree from Bradley University. After graduating she did some post-graduate work at the Siena Art Institute in Siena, Italy. Her passion lies in making meaningful, thought provoking, abstract art. Her current series of artwork is being created completely from sustainable agriculture. Her kitchen and studio are now one in the same. 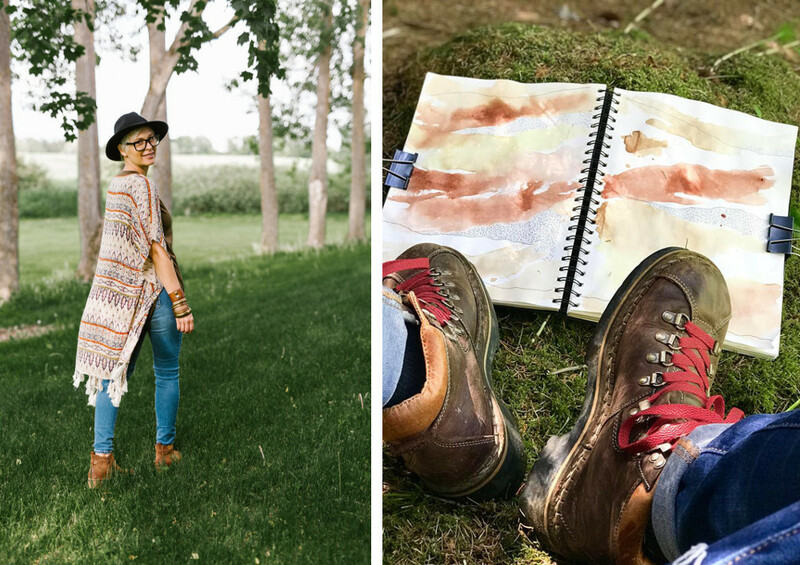 It’s there, that she takes organic food products and turns them into “paint”. 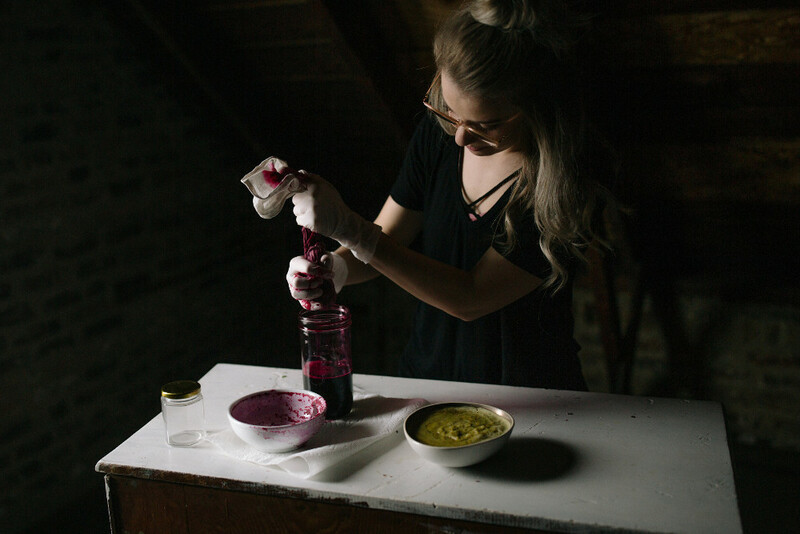 Using things like beets, cilantro and saffron, Britni constructs completely non-toxic, environmentally friendly artwork. "The sustainability movement is not new, it is however finally coming to the forefront of media and culture. I try to live a sustainable lifestyle, like every concerned human. I do not eat meat, stay away from single use plastics, and recycle. My two great passions in life, cooking and art finally just melted together. It was not a specific moment in time, there was no event that prompted me to start this series. It simply made sense to take my passion for food, the environment, and art to create something truly unique. I guess the answer to your question is, that my outlook on sustainability changed every aspect in my art practice. I'm no longer using resin, alcohol inks, acrylics, oils or anything that is even remotely toxic. My first instinct was to pull the "color" from the plant and bond it to a medium. So very early on, there is some acrylic medium on the canvas. I ran a myriad of tests and found a way to keep the "color" from molding, or changing without the use of a medium. Canvases I create now have zero acrylic medium on them. I'm unsure how long they will last without yellowing, and I am completely okay with that. The work to me is less about the physical artwork, and more about the conversation started around the work. Are they interesting alone? Yes. Are they more interesting once you learn how and what they are made of? Yes. Are they starting conversations about sustainability? I hope so."